It’s been a crazy few days for our family. My father in law wound up in the hospital with multiple blood clots in his lungs and will be in the hospital through Christmas Day. So needless to say, we will be spending part of our Christmas stuck in a hospital room. He’s in great spirits however, not in a lot of pain, and very thankful to still be with us. So for us this Christmas, we are very thankful to have him still with us. Regardless of whatever gifts come our way this year, that will be the most precious. With that said, that is the reason I have been a little vacant from the blog the past few days, and why I wont be back to the blog until January. The rest of the Christmas Holiday is going to be spent with family and friends, and enjoying the precious gift of life that we all have. I hope you all have a great Christmas, and I look forward to coming back in a week or so! It’s hard to believe that it is almost that time of year again. Beginning January 1st, 2012 you will be able to complete the Free Application for Federal Student Aid (FAFSA). This financial aid application will be used to qualify you for financial aid for the upcoming Fall semester in August 2012. Yes, it is 8 months in advance, and yes you should do it as soon as possible! The Department of Education has recently released a sneak peak version of the 2012-2013 FAFSA Application. You cannot actually submit this worksheet, but you can begin working on the draft version today, so you will be fully prepared to submit the real document when it becomes available on January 1st. Procrastinating on completing your FAFSA could mean the difference in thousands of dollars in college financial aid. For example, the FAFSA deadline for many colleges is February 15th. If you wait until January 1st to begin gathering the documents needed, you will likely miss out on this deadline. If you miss this deadline you will miss the priority date for your college’s scholarships and grants program and lose any potential financial aid you qualified for through your school. Even though this worksheet is available, you do not want to submit a paper copy of the 2012-2013 FAFSA Worksheet. The electronic application at http://fafsa.gov will be available beginning January 1st, and that is where you should submit your application. Submitting a paper FASFA could take 5-6 weeks to even get to your school, whereas a FAFSA submitted on the web will take a maximum of 48 hours. There is also a really neat tool that is new this year for the FAFSA called IRS data retrieval. If you have successfully submitted your IRS tax forms, then you can “retrieve” that data through the FAFSA form. When this data is retrieved it will automatically populate the FAFSA form so you do not have to compare line by line figures. This one change alone could save you hours in completing your FAFSA. The Department of Education may not be perfect, but they are trying very hard to make the FAFSA completion process less of a barrier to applying for Financial Aid. The best way to be prepared is to know what to expect. 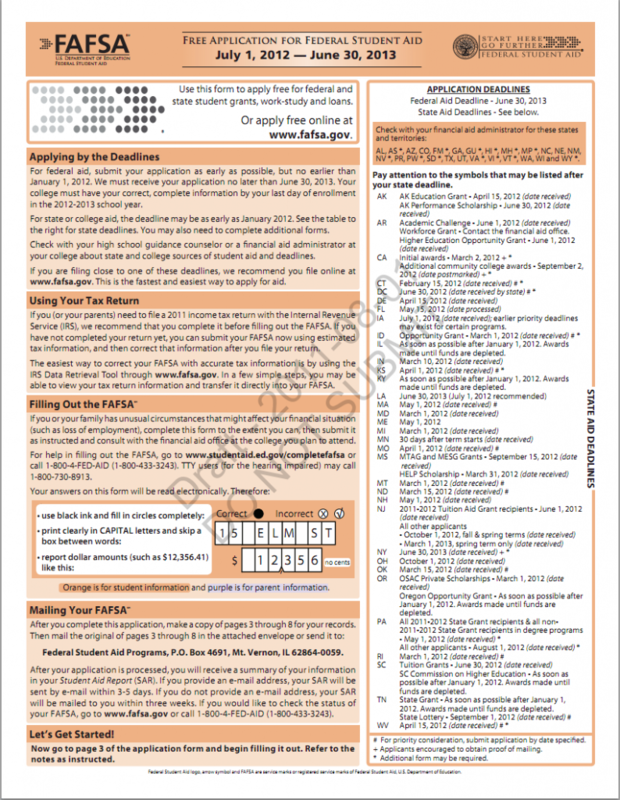 Print out a copy of this 2012-2013 FAFSA worksheet, and look it over to know exactly what to expect when you sit down to complete your FAFSA in a few short weeks. Understanding Your Financial Aid Package, plus a sweet video! There is a lot of information floating around the internet about how a school constructs your financial aid package. In fact, this might be one of the most misunderstood parts of the financial aid process and something we have talked a lot about here at Money for College Project. There seems to be a large disconnect between submitting a FAFSA and receiving your financial aid package back in the mail. By working in a financial aid office for many years, I have become a little jaded to the fact that these letters are difficult to understand. However, every time I meet with a student who is lost about the entire process, it become clear to me all over again, that this is really confusing! I am always trying to find better ways to explain this process to students and parents, and I ran across a video recently that I think does an excellent job of explaining how the process works. The video is created by Brown University, so there are a few Brown specific statements made, but overall 98% of the information presented will work at all colleges across the U.S. The information is so universal because virtually all colleges accept federal financial aid, and the U.S. Government regulates how their funds are awarded. Not all schools meet 100% of demonstrated need when creating their financial aid packages (most Ivy League and top tier schools do). The FAFSA can be submitted on January 1st, in preparation for the upcoming Fall semester in August. Do you have any questions about how a financial aid award package is created? Please discuss in the comments! Finally back in town after our 7 day cruise to the Western Caribbean. It feels very strange to have missed Thanksgiving, and to suddenly be thrown full force into the holidays without having any lead up time. Also, it is a bummer to come back to cold rainy weather here on the east coast, after being in perfect 80 degree and sunny weather for the past week. However, I am glad to be home. As crazy as it sounds, I have missed writing on Money for College Project, and I have missed interacting with you all. A lot has happened in the last week that I need to catch up on! As I am transitioning back into the American way of life I have become even more aware of how wealthy we are as a nation. On our cruise we visited Grand Cayman, Cozumel Mexico, Belize City in Belize, and Isla Roatan in Honduras. Grand Cayman and Cozumel have long been cruise and tourist destinations and have adapted to the influx of tourist money quite well. You can’t go 100 feet without running into a duty free shop or a jewelry shop. Belize City and Roatan are a different matter however. 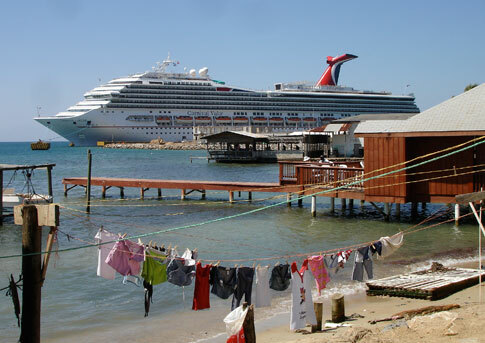 Carnival Cruise lines literally created the ports in both of these locations. When you get off of the cruise ship you are greeted by very American looking shops with pearly white floors, fluorescent lights, and credit card machines. You can walk the streets of the port and feel as if you are in any beach town U.S.A. However, when you walk through the back gate of the port to book a taxi to go on an excursion or see more of the country, you are greeted by the real country, and real third world poverty. My wife and I already knew this to be the case. My wife had visited Belize twice before on mission trips and stayed in the villages of the country. I have not been to any of these countries before, but I have been to many central and south American countries, and well as spending 6 months in Malawi, which taught me a great deal about what real poverty is. So we were not shocked by the poverty of the country, but I could tell by the reaction of many of the American cruisers, that they did not expect this at all. In fact, many of them never left the port because they did not want to leave the utopia created by Carnival. I felt bad for many of the local craftsman as I could hear them being berated by Americans for charging high prices for their custom wood carvings, or for charging a high taxi fare (in a country where gas is over $6 per gallon!). It seems that we as Americans easily forget that we are truly a financially blessed nation, even with the downturn in our economy, and the financial crisis that so many of us are struggling with. In comparison with the poverty in these tourist destinations, we are still fabulously wealthy. I don’t mean to hop on a soap box or anything, I just think that it is very important to always have a new perspective and a broad world view. It is so easy to get caught up in our narrow minded focus and lament the problems facing us, but when confronted with the broader problems and struggles of this world, it often makes our own problems pale in comparison. Obviously people on a Carnival Cruise were there for a vacation and we all paid good money to enjoy ourselves. For many people, enjoyment does not mean subjecting themselves to the poverty of a third world country. For me, it is refreshing and motivating. I can look back on my week outside of the United States and approach this holiday season with a fresh perspective. Last week I posted a top 20 best christmas gifts for college students list. It has been far and away my most popular article I have ever written, and I think that tells us a lot about our culture (and that I sold out a wee bit to appease the Google monster…it worked!) Christmas time in America, is no longer just about celebrating with family and enjoying quality time while exchanging meaningful presents. It has become a celebration of materialism. The fact that the majority of the gifts on the list I made were over $200 also says a lot. We spend a fortune on Christmas ever year! (Well, the majority of Americans do anyway). My wife and I had a lot of fun buying all of our Christmas gifts from the local artisans we found in the ports, for a fraction of the price we could have here in the U.S. We were also able to meet the craftsmen and women who made our gifts, and support them directly. No middle men. It was a lot of fun, and even more rewarding for us. This cruise came at a very good time for me. Going into the Christmas holiday I have a different perspective on things that I think I ever have before. It’s easy to get wrapped up in materialism and commercialism around the holidays, but I strongly believe that we are much better off without it. I have wanted to start this for some time now, but laziness has set is, and it has not happened yet. But starting today I am committing myself to a weekly roundup of the posts here on Money for College Project, my favorite articles from around the web, and also the top article from my fellow Yakezie Members! Without further adieu……here is the inaugural edition of the Money for College Roundup! Wanna Win the Iditabike? You Need a Diet of Cookie Dough Something I have secretly always wanted to do…bike across Alaska! Not finance related at all, but I think it will enrich your life. Coworking: Sharing How We Work For all of your freelancers and work at home folks, you need to be up on the current trend of Coworking. If you have not tried it, I highly recommend it. I have even considered opening up my own coworking space in my hometown. Definitely an awesome tool for entrepreneurs! An Early Education in Financial Literacy Starting out the financial education of our children at a young age is crucial to our global future financial stability. So what if it starts in Girl Scouts. The Free Monkey Problem: The High Cost of Free Things You have all heard that there is no such thing as a free lunch….but now you need to learn that there is no such thing as a free monkey. How to Quit Mindlessly Surfing the Internet…. We all are guilty of this. Sitting down at the computer with every intention of being productive, and then trailing off into a rabbit hole of time sucking activities (sometimes quite literally). Here is how to avoid all of that. Money Talks – What is Your Worst Case Scenario? Beating Broke – Are Banks Getting a Bad Rap? One of the biggest problems that occurs in any financial aid office around the country is their inability to effectively communicate with students. Financial aid information can be complex, deadlines can be rigorous, and to most college students, finding money for college is incredibly boring (although incredibly important as well). So this creates a problem. College students desperately need to hear this information, but they don’t want to listen, and financial aid offices do not know how to effectively reach out. As a student or a parent, this creates a very specific opportunity for you. Since the burden of discovery is placed squarely on your shoulders, the more effort you put into seeking financial aid information, the more reward you will receive. As with most things in life, financial aid comes to those who hustle. By hustle, I don’t mean anything seedy, I simply mean that the more effort you put into your financial aid, the more benefit you will receive. The more scholarships you apply for, the more likely you are to win one. The earlier you submit your FAFSA the more federal grant money you will qualify for. The harder you work at your academics and the more clubs you are involved with, the more likely you are to earn a scholarship or school grant. The more you communicate with the financial aid office, the more chances you have of finding new sources of aid that you did not realize existed. Financial aid is often used as a reactionary office. What I mean by that is students never come through their door unless they need something or something is wrong. Very rarely does a student come through to ask about what they can be doing proactively to earn more financial aid for the next year. This simply does not happen. However, I almost guarantee you that a financial aid counselor’s face will light up if you do go into their office and ask that question. The more work and effort you put into making sure you are receiving the absolute maximum amount of financial aid, the more you will earn in return. College students are a difficult bunch to communicate with. With modern technology, the majority of students have access to email and the internet from their smart phones. This means that email, social media, and other electronic messaging formats are the best way to communicate with students. This is true, but their effectiveness is still very slim. The majority of college students rely on their parents to handle all of their college finances, and they will either forward or disregard an email from the financial aid office. This simple action could be very costly, especially when there are strict deadlines involved. If you receive a communication from the financial aid office, you should read it. I guarantee it is important. Financial aid offices have too much to do to send out frivolous messages. The sooner you react to the message that you receive, the sooner you can receive a positive outcome from it. Also, it could never hurt to suggest better ways of communicating with you to your financial aid office. This is an ongoing problem, so they will likely listen attentively to any suggestions you have. Here are a few final tips that will help you in your questing of finding money for college. Always adhere to deadlines. You might take this step for granted, but missing an important priority date or deadline, could potentially cost you thousands of dollars in financial aid. Many awards are given out on a first-come first-served basis, so it is always good to get your application completed as early as possible. Be Accurate. When filling out financial aid forms, it is critical that you are accurate. One misplaced number in a social security number, or an extra zero on an income could throw off your entire application and potentially forfeit thousands of dollars in aid. It might not sound ethical, but applications that need corrections or revisions, generally miss out on the first round of financial aid awards. Be Aggressive! Please remember that this is the financial future of your student on the line. Financial aid offices are renowned for giving people the run around, and for not going “above and beyond” to assist a student. Like J.D. Roth always says, you are the only person that has your best interest in mind. That means the responsibility falls on you to ask the right questions, and ensure that you receive every scrap of financial aid that you are eligible for. Find a Friend. I highly recommend trying to make friends with a financial aid counselor at your college. They see lots of students every day, but if you are able to develop a personal relationship with your counselor, they are much more likely to go out of their way to assist you.